The St. Clair County Courthouse at 655 2nd St in Osceola, Mo, houses a number of county departments that have a large number of records on file that are available for research. The Recorder's office has marriage records dated from 1855 to the present, property records from 1840, one year before the county itself was established, to the present, as well as naturalization, tax lien, wills, and other records, all with varying dates of availability. The Recorder's office also has a large portion of its records available on a public computer terminal that is free to use. 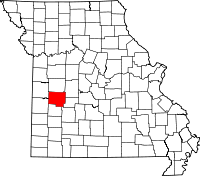 The County Clerk's office has permanent birth records from 1883 to 1890, death records beginning in the same year until 1887, rural school records, and many other random records, such as inmates of state asylums. The St. Clair County Historical Society is in Osceola and operates a museum and research library at 660 Main Street.